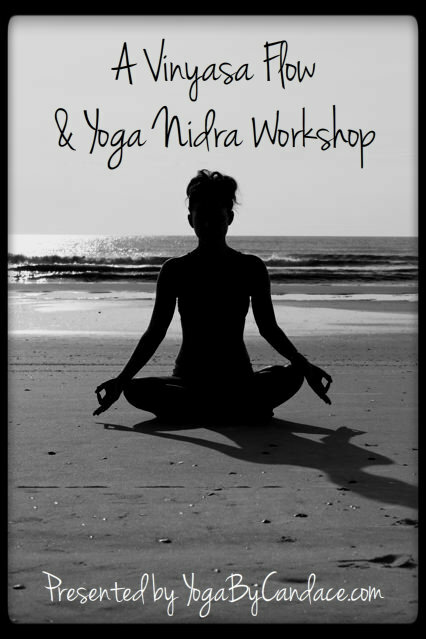 What: A vinyasa flow & yoga nidra workshop. Vinyasa flow is a yoga class suitable for all levels. It is very much a personal practice- there is no competition and no expectations. In this workshop, we will do an hour and a half of vinyasa flow. It will start with a short meditation, then move into a physical practice. After the class, we will do a half hour of yoga nidra. Yoga nidra is a guided deep meditation also known as a yogic-sleep. You will feel a deep sense of calm and quiet, as if you are sleeping, but you will be completely awake and aware of yourself and your surroundings. It is said that one hour of yoga nidra is equal to four hours of restful sleep! The end result will leave you feeling incredibly peaceful, calm and aware. How: Pay $25 at the door. Alternatively, fill out the pre-registration below and pay $20.00 online. Space is limited, so it is recommended that you pre-register. The workshop fee is $25 at the door, or, if you pre-register and pay online you can save $5.00! Choose either PayPal or Google Checkout to pay online and YOGABYCANDACE will send you an invoice. Please pay within 24 hours.